Villa Agios is a privately owned villa located literally on a pebbled beach with breath-taking views and exclusive pleasures, tailored to blend comfortably and stylishly into its natural environment. Nestled in acres of beautiful gardens, one can feel that nature is respected here, and it rewards visitors in ways that simply need to be experienced: a private pebble beach just steps from the villa offers a truly enigmatic escape to the Greek seas, while the imposing beauty of the mountains challenges the mind for a little adventure. With more than 15 years of experience in welcoming guess at Villa Agios, we constantly strive to exceed their expectations. Ideal for families with young children, the villa is completely safe and perfect for babies and toddlers. One bedroom, with king-size bed, plasma TV, ceiling fan, A/C, renovated en-suite bathroom (2017), unobstructed ocean & pool view, direct access to terrace with amazing sea views. One bedroom, with super king-size bed, plasma TV, ceiling fan, A/C, en-suite bathroom, large window with garden view. One bedroom, with king-size bed, plasma TV, ceiling fan, A/C, renovated en-suite bathroom (2014), window with pool view. One bedroom, with two single beds, plasma TV, ceiling fan, A/C, direct access to terrace, garden, and pool. If you are looking for a historic adventure, we urge you to visit the ancient city of Delphi. Only 50 minutes drive to the 2nd most popular archeological site in Greece, after the Acropolis. For the ancient Greeks, Delphi was quite literally the center of the world; the place where universe meets earth and the home of the legendary oracle Pythia. People came from all over Europe to call on Pythia and have their questions about the future answered. The Pythia was the medium through which God Apollo spoke and provided counsel to all who needed it. For complete rejuvenation of body and soul, you can find two of the most prestigious wellness spas of Greece in the nearby area: "Galini Wellness Spa" is just a 5-minute drive and provides a truly relaxing and revitalizing experience. Skilled therapists create sensory journeys for guests with a range of holistic wellness and pampering treatments. The "Thermae Sylla Spa", located on the island of Evia, in the town of Edipsos (30' by boat) is considered one of the best 10 Thermal Spas in the world (based on Conde Nast Traveller). What makes this spa unique is the natural thermal springs, where water spurts from 3000m deep at a temperature of 75C. This unique water spurts in these springs for the past 20,000 years! Comfort, care and luxury find a unique home on Villa Agios. A place to call your own. An experience to bring back home. Happy mother, world traveler, marketing & tech enthusiast, protector of stray animals. The location of this villa is truly one of a kind. It is priceless because the villa was built during the 70's, when it was allowed to build villas only steps from the sea. The sea is always calm like a lake and totally safe. The private swimming pool is 100 m2 with fresh sea water. The villa is an exceptional choice for families, especially with young children, as it provides a very safe environment with lush gardens and play areas for the little ones. View more about Christina S.
The villa has five bathrooms - 3 en-suite and 2 regular baths. Villa Agios is literally on the beach! The beach has small stones, pebbles and lots of sea shells. Rarely crowded - almost private - with crystal blue waters and safe to swim. The imposing mountain of Oiti is a 30-minute drive from the villa, with beautiful nature, small traditional villages and yummy tavernas. 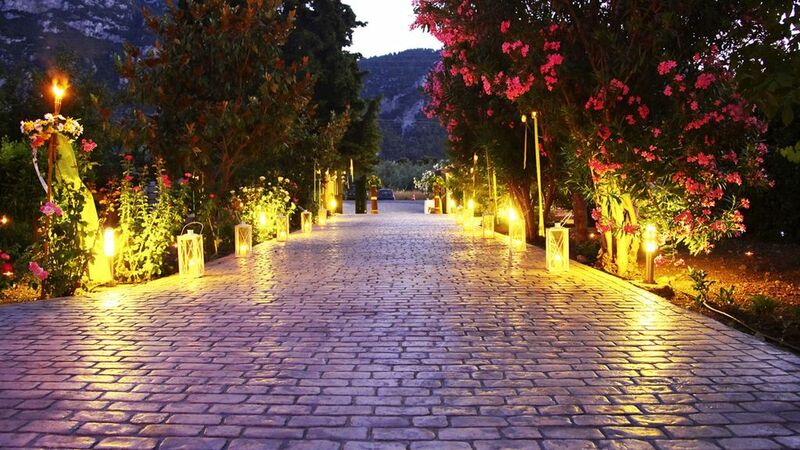 Agios Konstantinos & Kamena Vourla are the closest villages/towns to the villa, at approximately 5-minutes by car. Unobstructed 100% ocean view from most of the villa's living areas. All rooms feature A/C and ceiling fans. Central heating in all villa's premises. Fresh pure cotton linen, changed twice per week. One of the best experiences of the villa during winter. Plenty of outdoor space for more than 4 cars. WiFi is available complimentary to our guests. Fresh pure cotton towels, changed twice per week. First floor: Grand living area with large fireplace, comfortable sofas, lounge chairs and plasma TV with cable channels (English menu). Two dishwashers in first and ground floors. 2 large refrigerators in first and ground floor. 1 small refrigerator in BBQ/Bar. 2 Nespresso coffee machines. We can provide, upon request, Nespresso capsules of different coffee varieties. We provide renters with fresh bottled water. Plenty of dishes and utensils for more than 30 people. Two fully-equipped kitchens in first and ground floors. Grand dining area for 8-10 persons. Smaller dining area on ground floor for 4 persons. Child's highchair can be provided complimentary upon request. Plasma TVs in all living rooms and bedrooms. Satellite TV with hundreds of channels are available at the grand living area. All bedrooms have plasma TVs with regional TV channels, as well as some international ones like CNN, BBC. Dozens of books in English, Greek and Russian languages. A large CD library available for our guests with pop, jazz, electronic, and classical music. We provide a few toys for our little ones, especially for babies and toddlers. Hundreds of DVDs available with box office movies. Lush gardens with lots of trees and flowers for endless play and relaxation. Ground and first floor balconies with comfortable sofas, dining tables and lounge corners. A two-seated professional kayak is available upon request (additional costs apply). Speed boat to rent upon request including experienced skipper, that can take you to beautiful small sandy islands, just 10 minutes away from the villa. Large verandas with tasteful outdoor furniture, provide our guests with a lounging atmosphere accompanied by stunning big blue views. Smoking is allowed in outdoor areas only. Extra large private swimming pool with fresh sea water, that is daily cleaned. We welcome our guests with home-made pies, honey, milk, cereals, selection of bread and cheese, local wine and ouzo, all provided complimentary. Villa Agios offers maid service and gardening/pool cleaning every second day. Upon request, we can arrange additional services such as private cook, boat rental, car rental, baby-seating and creative activities. The outdoor area of the Villa is also the home of a few friendly cats, that are all vaccinated and taken care of when the owners are there. The cats can easily adjust to the level of intimacy our guests will allow them. Villa Agios is one of the best places I have ever had the pleasure of visiting. It is private, yet close to everything you could want. The rooms are big, clean and very comfortable. Very important: they have AC installed in every room!!! Τhe garden is beautiful, with a huge pool, multiple sunbeds and umbrellas, table tennis, an outdoor bar and of course the barbeque which we used again and again. The owners were very nice to us. They even gave us a tour of all the supermarkets, restaurants and other useful places in the area. The position of the Villa was spot on and easy to reach, just a 2 hour drive from Athens airport. We had a wonderful holiday and will most likely be coming back! We came for a long weekend, just wanting to get away from the city and be in the countryside. We didn't expect the location to be this unique - the house is literally ON the beach. Our group consisted of 4 adults and 3 children. Although off-season, we really enjoyed the huge fireplace and the sea view. The house is well equipped - the children particularly enjoyed the table-tennis table. We will be coming back this summer for sure! Thank you Andreas! We are looking forward to welcoming you again this summer! This is a very well-equipped and attractive house, right on the beach front, and with a very short drive to Kamena Vourla, which has a supermarket, restaurants etc. The pool is great, the beds comfortable and we felt very well looked after. Thank you Catriona for your kind words. I am glad you and your family enjoyed our villa and you are always welcome to visit us again in the future! This is a truly a beautiful location. The villa is absolute beach front on a lovely beach with crystal clear water, ideal for swimming. The villa has a magnificent salt water pool as well. We loved our stay and highly recommend this property. Christina was very helpful and organised everything including assisting with language difficulties when it came to our rental car. A very relaxing holiday, that we travelled all the way from New Zeland to enjoy. We have been travelling to Greece every summer for the past few years and have been to numerous villas and can say with no doubt that Villa Agios was by far the best villa we stayed in. We were one extended family, a total of 6 adults and four children (ages 2 – 9). The villa was perfect for us since it enabled both privacy for each “small” family but also plenty of areas where we could all sit together: large dining tables both inside and on the terrace, another dining table and bar by the pool, a very large pool and plenty of sitting areas around it and of course the beautiful beach which is just outside the gate. The villa is actually two separate apartments, the lower one allows total privacy for a family of 5 and includes its own kitchen and living room and two bathrooms. The top villa has 3 bedroom, a beautiful living room, a large and fully equipped kitchen. All areas are nicely decorated and well maintained. It seems as if the villa owners thought of everything their guests may need, and supplied it. Upon our arrival we were welcomed with homemade pastries, ouzo, wine and juices, and this generosity and a feeling that the owners are not just renting us this villa, but also really want us to enjoy it, continued throughout the whole vacation. The villa is very clean, and during our 10 day stay, was thoroughly cleaned three times. Every question or request we had was answered right away by Christina and Jason, which were very kind and welcoming. The area is very nice and calm and there are plenty of opportunities for day trips. We were out on very few occasions since we enjoyed the villa so much we didn’t feel like going out. We really have only positive things to say about this great place, we will definitely come back and wholeheartedly recommend it. Dear Maya, thank you for your kind words. We were very lucky to meet you and your wonderful family and we are looking forward to welcome you again next summer! Villa Agios is located literally on an almost private pebbled beach, with stunning ocean views. Its proximity to Athens - only 2 hours drive - make it an ideal location for families with young children. The villages of Agios Konstantinos and Kamena Vourla are only 5-minutes away by car, and they offer a large variety of super-markets, grocery stores, restaurants, tavernas, bars and activity centres. The islands of Sporades can be easily reached from the port of Agios Konstantinos for a memorable day tour. For those with a historic interest, the ancient city of Delphi is about an hour drive from the villa, with the 2nd most popular archeological site in Greece after the Acropolis. Spa treatments can be arranged at the 5-star "Galini Wellness Spa", located in Kamena Vourla (5-minutes drive from the villa). The villa is strategically located between ocean and mountain, so if you're looking for trekking adventures, you should definitely visit the mountain village of Pavliani with fascinating trekking routes with waterfalls and vivid nature. The Villa offers maid service and gardening/pool cleaning every second day, as well as free WiFi throughout the villa, included in the price. A security damage deposit of 1,000 EUR is required upon check-in (in cash) and will be given in full during check-out following the villa's inspection for any damages.